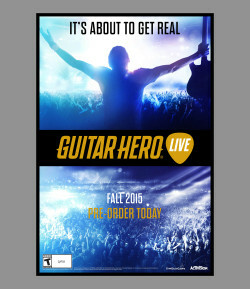 “Guitar Hero Live” goes black and white, but new gameplay modes add a ton of replayability. Thanks to two awesome new gameplay modes and a new guitar peripheral, “Guitar Hero Live,” from our initial playtime, is a damn fun addition to the series that not only makes great use of next-generation console technology, it’s also loaded with content. That in itself would get gamers happy, but the new guitar changes the game big time. While it may take a little more time to get used to, the two rows of three buttons are just as fun a way to play as the old way. Real guitarists may even enjoy this game more as some of the button presses feel similar to chords. Overall, the gameplay is just as frenetic and difficult as it’s always been. It just takes a few songs to get back in the groove. Gone forever are the cartoony visuals in the main story mode, replaced by a first-person camera and 3D sound. For the first time in the history of the series, you’ll be playing with a real band that feeds off of your playing. Miss a few notes and you’ll see an angry Bassist. Mess up a solo and the lead singer will be the next one to look pissed. Screw up a whole section of a song and the crowd will let you hear it too. Interacting with the band before, during and after each set, you’ll feel more of a connection than you’ve ever felt before in the series.